Let me repeat that. 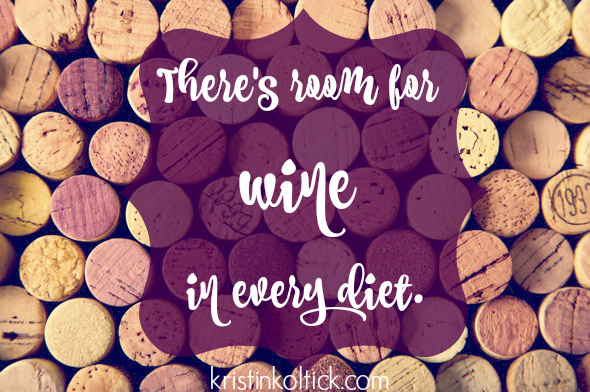 There is room for wine in every diet. And by diet, I really mean nutrition plan, because we all know “diets” don’t work and are a complete waste of time. But, I digress. When I first began my journey into health and fitness, I heard a lot of hoopla about having to cut alcohol out my diet. Of course, I was incredibly turned off by this fear mongering and immediately began to panic. I love wine. I drink a glass almost nightly, and on the weekends I prefer to have several….bottles. Just kidding. Unless it’s a really wild night. The idea of being on an alcohol restriction made me feel like I was doomed to failure. Not because I have an alcohol dependency, and not because I couldn’t give it up. I refrained from alcohol throughout 10 months of pregnancy (Yes, 10 months. I was pregnant forever.) My fear of failure came from the overwhelmth (that’s probably not a word) of having to change my entire life all at once! I knew how difficult it was going to be to get myself into a habit of working out everyday. I knew that it was going to be near-impossible to stay on track with my nutrition. But I was ready to give 100% to that change. But giving up wine? I didn’t sign up for that and I didn’t want to do it. It was just too much change at once. I mean, who the heck likes change anyway? Plus, there’s plenty of evidence floating around indicating that wine might actually help you maintain good health. Why give it up? So I did what any thirty-something woman would do and I just said no….to giving up wine. 7 months and 43 bottles later, I am down 23 pounds and counting. I am comfortable with my body and enjoy working out. I eat healthy most of the time, and I still enjoy my wine whenever I want. Sure, maybe I would’ve had quicker results without the wine. Or, maybe I would’ve given up altogether. The point is, you don’t have to give up wine to lose weight. I am living proof. That being said, I have put together a little list of wines and what their general caloric counts are, so you can choose your wine wisely. I’ve also included a few of my personal recommendations. Cheers! White Zinfandel is your absolute best option when counting calories. This wine has only around 105 calories per 5 ounces. However, a lot of wine drinkers don’t care for a White Zin, myself included. Your next best option would be a Chardonnay or Chablis, which are at the low end of the spectrum at around 118 calories per 5 ounces. 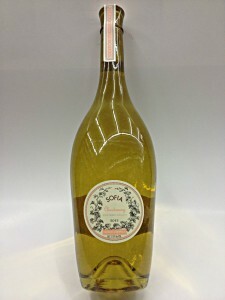 I drink Chardonnay frequently and one of my favorites is the Sofia Chardonnay produced by the Francis Ford Coppola Winery. This wine has a delicious hint of apple and spices, which is perfect for the fall, but enjoyable any time of year. I highly recommend trying this one, multiple times. Sèmillon, Sauvignon Blanc and Fume Blanc each have around 122 calories per serving. Dry Riesling, Pinot Gris and Pinot Grigio average about 123 calories. 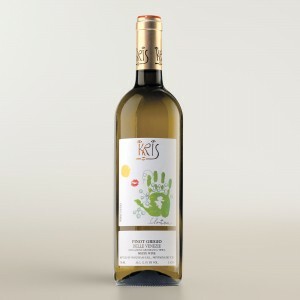 One of my absolute favorite wines is the Kris Pinot Grigio created in the Kris winery in Italy’s Alto Adige region. This wine has the perfect amount of subtle sweetness and goes well with almost any food! A sweet Riesling, which can have as many as 225 calories in each 5 ounce serving, is not a great choice for drinking regularly. However, should you choose to indulge in a sweeter wine from time to time, you MUST try this one! Eroica Riesling is produced in the Chateau St. Michelle winery in Washington state in conjunction with a German producer of fine Rieslings. I had the privilege of touring the facility during the early stages of the development of this wine and was also able to sample it. It was truly love at first taste, and this is one sweet wine I do allow myself to enjoy on occasion. As for red wines, the concept is the same. Dry reds yield lower caloric counts, while sweeter reds will be higher in calories. I personally don’t drink much red wine, but I like to know my options and I’m guessing you do as well. Pinot Noir and Grenache (or Garnacha) contain approximately 122 calories per 5 ounce serving. Syrah and Hermitage have around 123. Cabernet Sauvignon, Bordeaux and Merlot typically have about 125 calories per serving. Chianti has around 128 calories in each serving. When I do drink red wine, I prefer Chianti because it’s relatively mild. The Banfi Chianti Classico Riserva is an excellent choice and is very affordable. Now this isn’t a green light to start drinking excessive amounts of wine. As with anything else, moderation is key! If you’re as much of a wine lover as I am, check out this wine club for home delivery service of AMAZING specialty wines! You can even earn FREE wine by referring friends!